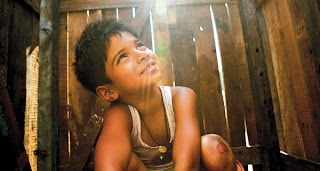 One of the great crowd-pleasers of the Festival so far is Danny Boyle’s “Slumdog Millionaire”. It’s a sweeping coming of age film, love story, exotic adventure and triumph of the human spririt all rolled up into a film about a young man who plays India’s version of “Who Wants to Be a Millionaire”. Danny Boyle injects his story with the same cinematic energy as his other classics “Trainspotting”, “28 Days Later”. It’s a surefire indie hit coming to a theatre near you. Pitted against the other grim realist dramas I’ve seen so far at TIFF, “Slumdog Millionaire” stands out as old-fashioned Hollywood escapism. Yet, there isn’t a recognizable Hollywood face in the entire film. It’s all set in India in 2006. A young Indian man Jamal Malik (Dev Patel) is on the Indian version of “Who Wants to be Millionaire”. He appears to have won but instead of celebrating we first see him strung up and tortured by the police who have accused him of cheating. After many excruciating torture techniques Jamal won’t confess. So they sit him down in front of the videotape of the show and Jamal recounts how he knew each and every question on the show. I saw the film in press and industry screening early yesterday morning. It was 9:00am and most of the crowd, like me, were still trying to wake up after a long day of movie watching, partying, or in my case writing late night reviews. After 120mins the film ended on such a high the entire audience applauded spontaneously – a rarity for the jaded businesslike industry crowd. And even more rare is that the audience stayed through the end credits.